A tarsal coalition is problem of the back part of the foot (just below the ankle joint) where the normal motion is absent, locked or reduced. This occurs because the bones of the back part of the foot, herein called the rearfoot, are fused together. This is mainly an inherited genetic condition that is most commonly first identified in teen-age children. 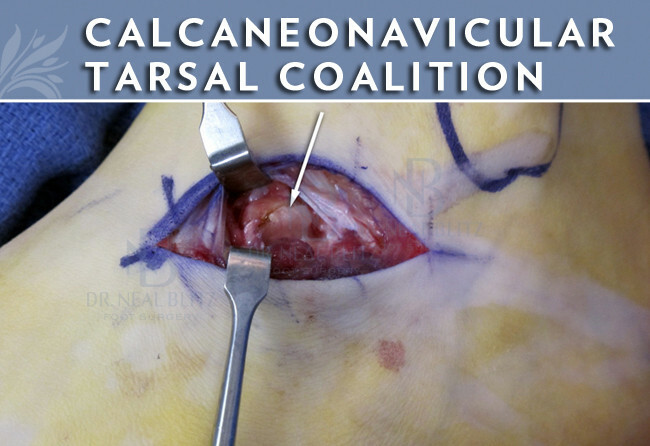 Coalitions are classified based on the type of tissue that binds the bones together (fibrous/scar tissue, or osseous/bone), and the bones that are involved (talocalcaneal, calcaneonavicular, talonavicular). People with tarsal coalitions may have foot pain. The pain can be localized to the back part of the foot, or be more widespread throughout the entire foot. Muscle spasms are commonly associated. Coalitions often cause a rigid flat foot, and that can be a tremendous source of arch pain and fatigue. A severe flat foot may push the heel bone into the ankle bone, and irritate tendons on the outside of the foot. 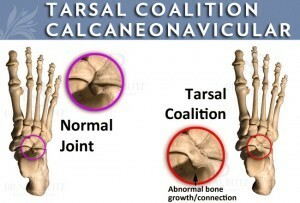 Additionally, coalitions can produce arthritis in the back part of the foot, resulting in achy pains. Genetics is the most likely cause for tarsal coalitions. While they can be present at birth, they don’t manifest for a dozen years until the bones solidify. Injury can also cause coalitions of the rearfoot. 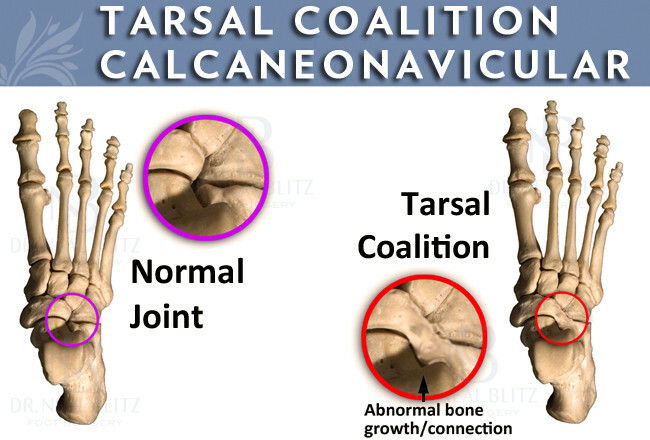 What is a Tarsal Coalition Flat Foot? It is well know that coalitions can cause flat feet. In particular, they cause a flat foot called a rigid flat foot – which is one where the position of the foot is stuck in that position. The foot may have any or all of the following features: collapsed and flattened arch, heel is deviated away from the midline, and/or front of the foot is pushed out (like a duck). Tarsal coalition rigid flat feet can be very painful. What is Tarsal Coalition Arthritis? Arthritis of the back of the foot is commonly associated with tarsal coalition – even in children and adolescents. The arthritis may develop as part of the condition process of with severe large coalitions. Dr. Blitz’ award winning research identified that arthritis is more common with coalitions that allow some micromotion (fibrous coalitions) and arthritis progresses with age. The presence of arthritis often determines the type of surgery that will be recommended. Unfortunately coalitions go undiagnosed for a long period of time in many patients. The clinical exam performed by a doctor may reveal it when there is severe stiffness. When flat feet are present, this often alerts the doctor to investigate deeper. Some coalitions are easily visible on xray, and others are seemingly invisble. MRI and CT will reveal the coalition, although some coalitions are not seen with advanced imaging. Common reasons patients seek treatment are: foot becomes painful, interferes with walking or activities, experiences difficulty fitting shoes, swelling, calluses/corns and/or notice a change in appearance of the foot and/or toe(s). Depending on your overall health, symptoms and severity of the coalition, the condition may be treated conservatively and/or with surgery. Non-surgical methods for tarsal coalition are aimed at decreasing and/or eliminating symptoms (pain). A cortisone injection is a powerful anti-inflammatory medication that is used to rapidly reduce the pain associated with an inflamed area and/or joint. The pain relief that you may experience from the injection(s) is often temporary. 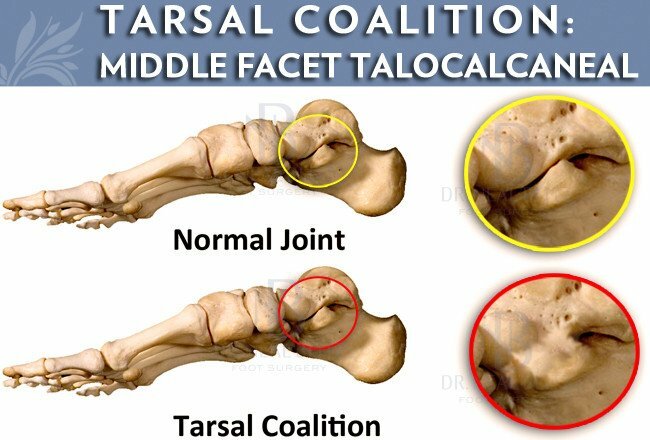 Surgery for tarsal coalition is divided in to 3 types – depending on the patient age, size and location of coalition, type of coalition, presence of a flat foot, and presence of arthritis. The simplest surgical option. The surgery involves simply removing the abnormal tissue to allow motion of the back part of the foot. A soft tissue spacer, such as fat or tendon, is placed at removed coalition site to limit bone re-growth. This surgery preserves the rearfoot joints. It does not specifically correct any structural malalignment. This surgery involves removing the abnormal coalition IN ADDITION to correcting the flat foot, if present. 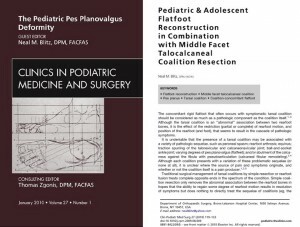 Dr. Blitz’ published and award-winning method involves removing the coalition and correcting the flatfoot in a single operation. The goal is to remove the restriction of motion AND structurally realign the foot, so that the foot may function in an improved more ‘normal’ position. The most drastic option of tarsal coalition surgery and involves permanently fusing one or all of the rearfoot joints. This means locking up the rearfoot motion completely. Dr. Blitz strongly tries to avoid this, and his published techniques are aimed at preventing fusion. However, some case fusion is necessary and Dr. Blitz believes that this surgery should be reserved for severe cases with large coalitions, significant arthritis of the foot, and/or a badly maligned foot. A main benefit of this surgery is that it allows for the foot be realigned. The long-term effects of rearfoot fusion may result in compensational ankle and foot problems. 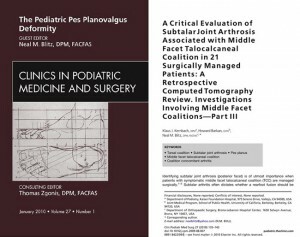 How To Select the Correct Tarsal Coalition Surgery? Picking the best procedure for a tarsal coalition is not always straightforward. Decision making depends on a combination of the following: patient age, bone age, extent of pain, location of pain, size of coalition, type of coalition, presence and severity of a flat foot and presence of arthritis. Historically, surgeons performed only two surgeries for coalitions – remove the coalition OR perform drastic fusion type procedures of the rearfoot. In most cases, surgeons performed the resection surgery as a first attempt and if that failed to then fusion surgery or flatfoot corrective surgery would be performed as a second repeat surgery. Dr. Blitz has a modern and progressive approach to tarsal coalition and has made significant important contributions to the surgical treatment of tarsal coalition by defining a procedure and treatment algorithm that removes the coalition AND structurally corrects the flatfoot in a single operation. His advanced method has been published in the Journal of Foot & Ankle Surgery. The befit of his technique is that it preserves much of normal anatomy of the foot, returns motion for proper foot function as well as structurally improving the alignment of the foot. Dr. Blitz strongly believes that major fusion surgery should be a last resort option. Dr. 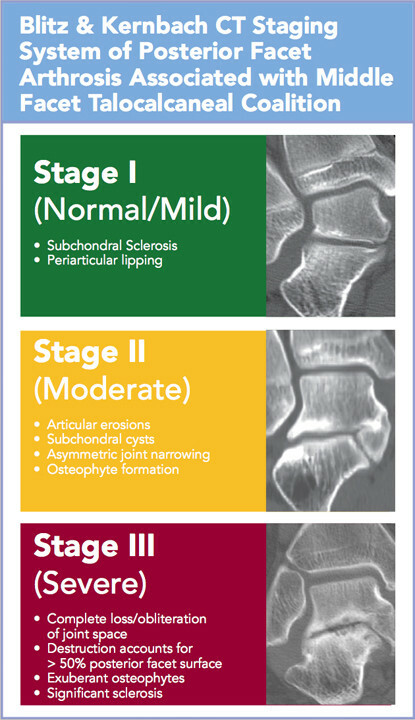 Blitz was the first to publish criteria to define the presence and extent of arthritis associated with tarsal coalition, that often determines the type of surgery and if a major foot fusion should be performed. This research won an award by the American College of Foot & Ankle Surgery, and was published in the Clinics in Podiatric Medicine & Surgery. Dr. Blitz’ research and techniques are aimed to avoid the major fusion type procedures and instead perform the corrective surgery that preserves foot function while treating the coalition. Recovery after tarsal coalition surgery is dependant on the procedures performed. With simple coalition resection, patients are walking on the foot with crutch support in a small surgical shoe. When flat foot surgery or rearfoot fusions are performed, the recover is more involved as patients require casting and nonweightbearing with crutches for 6-8 weeks. 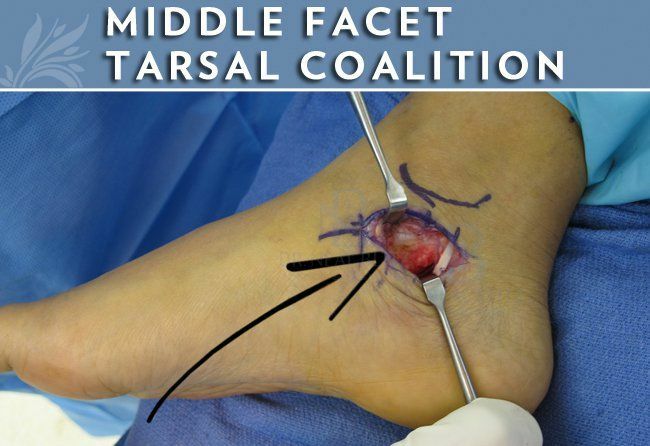 Most tarsal coalition surgery is performed as outpatient surgerym meaning that you may go hone the same day. It may be performed in a hospital setting or ambulatory surgery center. The surgery often requires regional, spinal or general anesthetic. There are general risks associated with tarsal coalition surgery, or any surgery for the matter, and the use of anesthesia. Complications may occur and are not necessarily your fault, or the fault of your surgeon. Nonetheless, you should understand the risks. Tarsal coalition surgery complications include, but are not limited to: infection, pain (temporary or permanent), swelling, hematoma, bleeding, blood clot, poor wound healing, incision breakdown, poor bone healing (delayed union, nonunion), malunion, nerve injury, neruoma, pain syndrome, RSD, disability, recurrence, flail toe, hammer toe deformity, metatarsalgia, unsightly scar, stiffness, weakness in toe, loss of toe to purchase ground, hardware problems, need for revisional surgery, and/or catastrophic loss. Overall Experience: Dr. Blitz has over 12 years of major experience in the field. He is at the forefront of tarsal coalition surgery and his protocols have modernized the way coalition is treated by surgeons. Lecturer: Dr. Blitz has a solid history of lecturing on tarsal coalition. Innovator: Dr. Blitz is an innovator for foot surgery. Patient Feedback: Please visit Dr. Blitz’s success story page, or his Facebook page. Blitz NM. 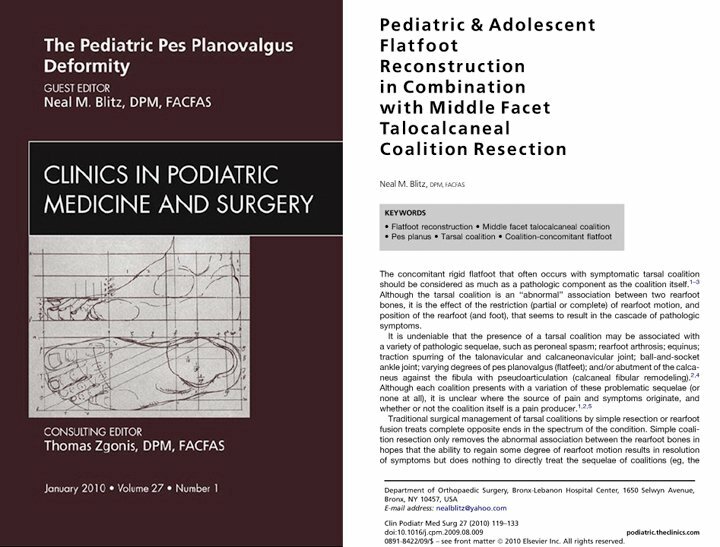 Pediatric & adolescent flatfoot reconstruction in combination with middle facet talocalcaneal coalition resection. 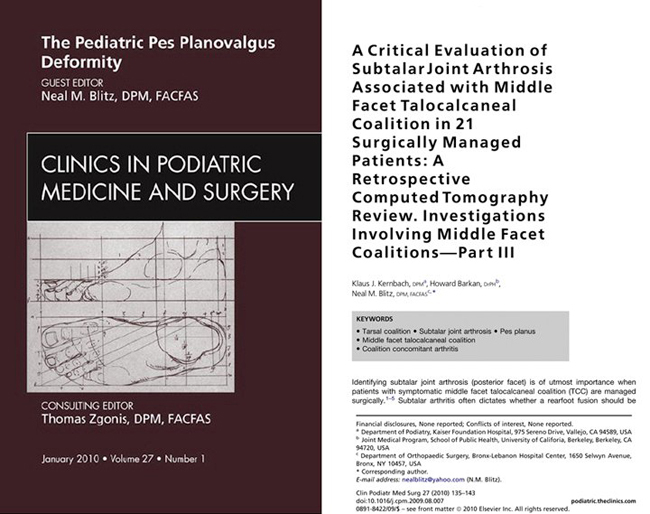 Kernbach KJ, Barkan H, Blitz NM.A critical evaluation of subtalar joint arthrosis associated with middle facet talocalcaneal coalition in 21 surgically managed patients: a retrospective computed tomography review. Investigations involving middle facet coalitions-part III. 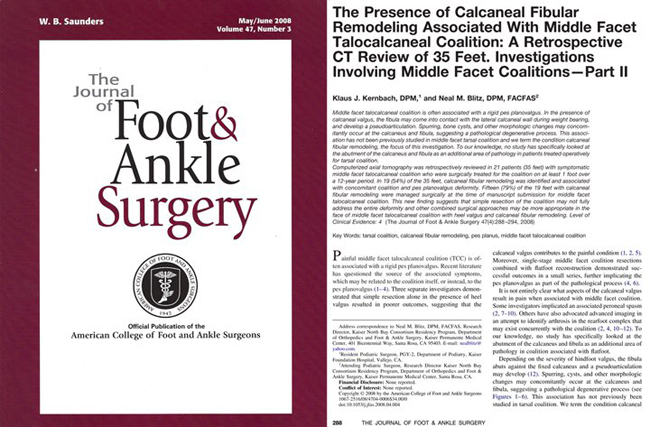 Kernbach K, Blitz NM.The Presence of Calcaneal Fibular Remodeling Associated With Middle Facet Talocalcaneal Coalition: A Retrospective CT Review of 35 feet. Investigations Involving Middle Facet Coalitions – Part II. 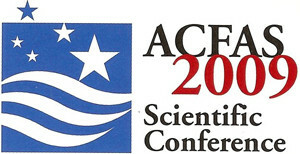 Honorable Mention, ACFAS Manuscript Presentation, 3/2008 The Presence of Calcaneal Fibular Remodeling Associated With Middle Facet Talocalcaneal Coalition: A Retrospective CT Review of 35 feet. Investigations Involving Middle Facet Coalitions – Part II. 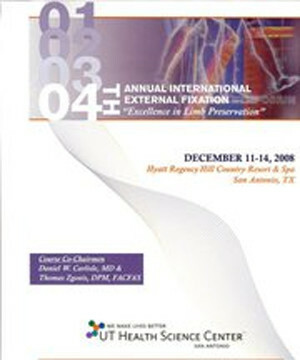 4th Annual Internal External Fixation Symposium San Antonio, TX – 12/2008. Kernbach K, Blitz NM, Rush SM. 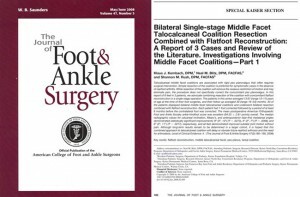 Bilateral Single Stage Middle Facet Coalition Resection Combined with Flatfoot Reconstruction. A Report of 6 Cases. Investigations Involving Middle Facet Coalitions, Part I.
Kernbach K, Blitz NM. 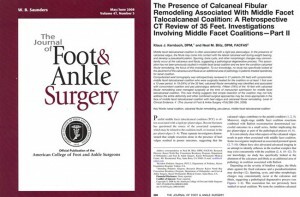 The Presence of Calcaneal Fibular Remodeling Associated With Middle Facet Talocalcaneal Coalition: A Retrospective CT Review of 35 feet. Kernbach K, Blitz NM. 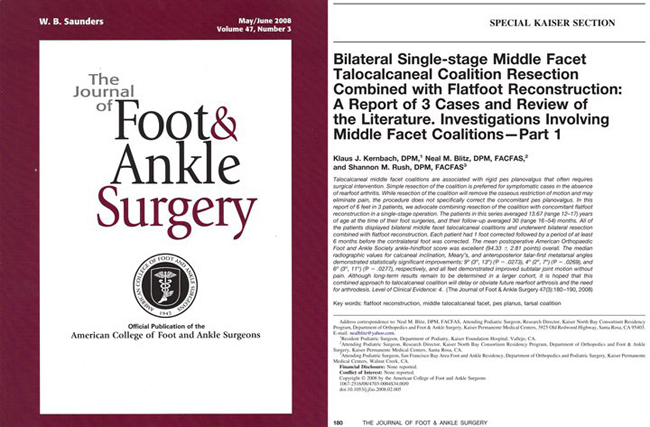 Bilateral Single Stage Middle Facet Coalition Resection Combined with Flatfoot Reconstruction. A Report of 2 Cases.